High quality rich amended compost that will add natural and organic matter to your soil. 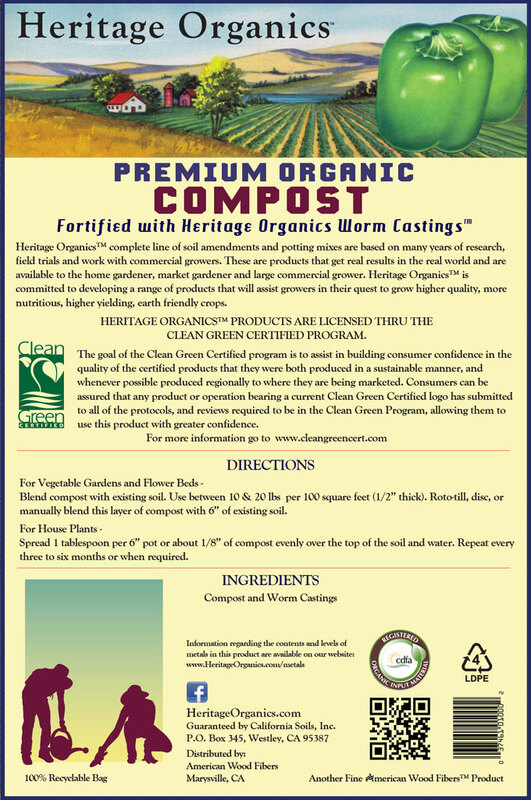 Fortified withHeritage Organics® Worm Castings. Add Premium Organic Compost to existing garden soil and house plants to improve soil drainage and increase aeration. For Vegetable Gardens and Flower Beds – Blend compost with existing soil. Use between 10 & 20 lbs per 100 square feet (1/2” thick). Roto-till, disc, or manually blend this layer of compost with 6” of existing soil. For House Plants – Spread 1 tablespoon per 6” pot or about 1/8” of compost evenly over the top of the soil and water. Repeat every three to six months or when required.